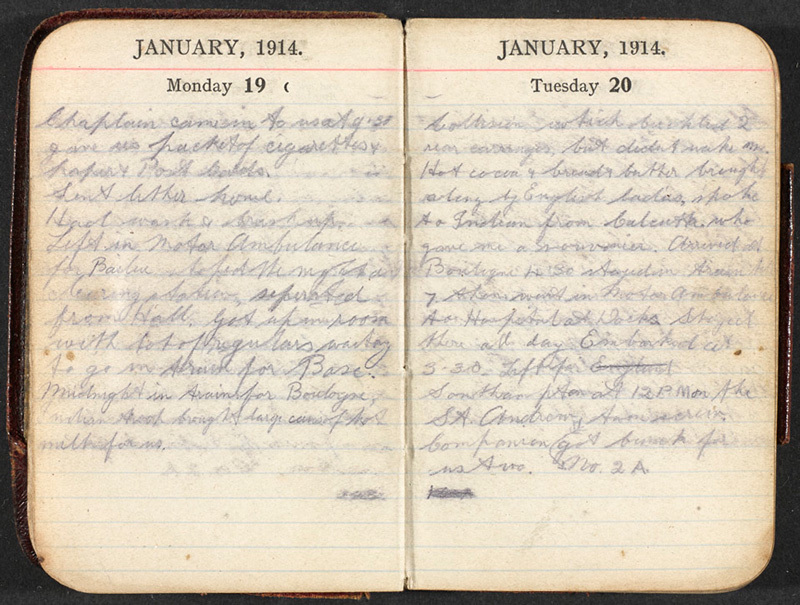 The pocket diary entries of Rifleman William Eve starkly reveal what daily life was like for soldiers in the trenches during the harsh first winter on the Western Front. By the end of 1914 the Allies and the Germans had established themselves in a line of trenches running from the Channel to the French-Swiss border. Until March 1915 the main activities on the British Expeditionary Force’s (BEF) front were artillery exchanges, sniping and mining operations. As both sides settled down for the first winter of the war, the struggle with the weather proved to be harder than that with the enemy in some sectors of the front. Artillery bombardment rapidly destroyed trenches, which had been built quickly and tended to be simple affairs. The bad weather and the destruction of pre-war drainage ditches also led to widespread flooding. No matter how cold or wet they were, the soldiers had to remain in the line. The pocket diary of Rifleman William Eve of 1/16th (County of London) Battalion (Queen’s Westminster Rifles), The London Regiment, reveals the grim realities of daily life for soldiers during this period. His unit was in the line near Armentières with the 18th Brigade of 6th Division. Guard 3.15-5.15 and then another half hour 10.15-10.45. 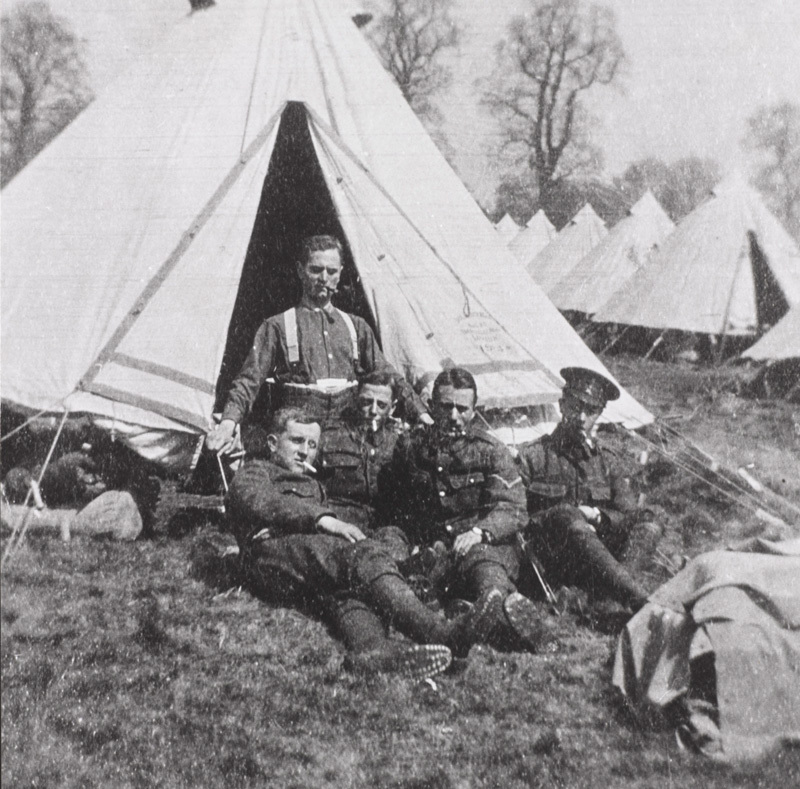 Went back to billet at about 11 o’clock to act as guard to Relief Guard of the DLI [Durham Light Infantry]. After being relieved went with another chap and had a couple of boiled eggs and coffee then got kit together and went with George for a tass[e] de café. Paraded at 4.45 moved to trenches at 5pm. Got told off with 6 others including George for delving [?] trench, had to go through sewer. Got jolly wet as usual. Went for shot to our trenches at rear nothing particular doing. One of our chaps hit by sniper, the bullet just grazed the top of his head. Very wet. Germans did a little shelling some falling very close to us. Raining hard. Everything in a very bad state. Had card from Mrs Nicholls. Sent card to Mrs Nicholls. Sergeant Wilson killed while sniping at flashes of the rifles of enemy snipers. Shot through the head. Dugout progressing favourably. Sent card to Mrs Goshawk. At second watch at about 3.40am had close thing, shot hitting sandbag in front of me. Heard cry in night of one of our fellows who was shot in the ankle. Woken up by George, who thought he heard a bughatch [?] fall in, but which was Robinson taken bad in the leg. He left at 5.20 for the dressing station. 3 of ours went out just in front reconnoitring, returned safely. Had cigarettes and letter from Lipport. Poured with rain all day and night. Water rose steadily till knee deep when we had the order to retire to our trenches. Dropped blanket and fur coat in the water. Slipped down as getting up on parapet, got soaked up to my waist. Went sand-bag filling and then sewer guard for 2 hours. Had no dug out to sleep in, so had to chop and change about. Roache shot while getting water and [Rifleman PH] Tibbs shot while going to his aid (in the mouth). Laid in open all day, was brought in in the evening, unconscious but still alive. Passed away soon after. Very wet day. Captain [MM] Shattock shot through the eye, passed away 2 hours later. Went on wood fatigue at night, had to wait 1 hour at SM and then had to make two journeys. Very muddy, got back just in time, got guard 9.50. Orderly. Sent letter card home. Card to Elsa and Mary. One or two aeroplanes passed over which we fired at, the shots going very near. Fine day. Heard officially that we are going out tomorrow to return after 4 days. Artillery drill, farms all round shelled, our artillery replying. [Brigadier] General [WN Congreve VC] of the 18th [Brigade] came down the trench at 3.30, was observed by the Germans and one of our fellows next to him shot dead. Rifleman [JD] Ingram. Lot of sniping done. One of our chaps being hit, the ones in the next trench all sent here as their place not safe. Lot of firing going on. At stand to went out to officers servants’ quarters and sat by large fire got nice and dry and then had to go on water fatigue. Captain Hewaters [?] led. In one place we had to go through about 2 feet of water. Were sniped at a good bit. Nos 3 and 4 companies relieved by the Durhams for 4 days. Quiet day. Very wet. Sent card to Mrs Hedges and one home. Had soup in packets issued for dinner. General Congreve passed down again at about 5pm. Just come off guard. Lot of sniping going on. Heavy shelling at houses in our rear. Some incendiary shells. Word passed down to keep close up to parapet as at 3.30 the brewery was bombarded. At 3 the Germans shelled the farm at rear where we get our water, our guns later (to time) replying rapidly. Excellent firing, the brewery being shattered, saw chimney fall. Snipers shot while leaving two of their shots before going through the officers’ hut, missing them by about a foot. The best bit of fun we’ve had. A corporal shot dead while passing where sandbag had a hole in it. Tossed with Williamson who should go on fatigues and sand bag filling. I lost. Party consisted of 4 filling and 4 carrying, we filed about 80 in 3 hours. Houplines. Were told to be ready to be relieved at 5 in the evening or next morning. Stand to with full equipment ready to go at 4am. Waited until about 5.30 before relieved. Marched to billets at Houplines. Got in ripping cottage with 4 others, George included. The people were awfully good, doing anything for us. Boiled water for us to wash our feet and bandaged them. After washing my feet were very bad, went for parcels which made them worse. George in the evening had to go on wood fatigue to trench. Paraded sick for feet. Wrote letter home. Gave Madam 5 pcs [postcards] as souvenir. Went to dressing station to go to hospital at 4pm. Waited in a sort of barn for horse ambulance. It arrived at about 8pm took us to Armentieres. Stayed the night in a hospital, had pea soup before turning in. In ripping room, stretchers as beds. Regular gave me German stud and English knife as souvenirs. Chaplain came in to us at 9.30 gave us packet of cigarettes and paper and postcards. Sent letter home. Had wash and brush up. Left in motor ambulance for Bailleul. Stopped the night at clearing station, separated from Hall. Got up in room with a lot of regulars waiting to go in train to Base. Midnight in train for Boulogne, Indian troops brought large cans of hot milk for us. Collision which buckled 2 rear carriages, but didn’t wake me. Hot cocoa and bread and butter brought along by English ladies, spoke to a Indian from Calcutta who gave me a souvenir. Arrived at Boulogne 4.30 stayed in train till 7. Them went in motor ambulance to hospital at docks. Stayed there all day. Embarked at 3.30. Left for Southampton at 12pm on the St Andrew. Companion got bunk for us two. Had breakfast at 8.15 in bunk, then went on deck. Saw Netley Hospital at 10am waiting to go in. Landed at 10.30 went straight in hospital train for Leicester. Stopped for tea at Bedford at 7.15. Got to Leicester about 8.30, taken by private cars to 5th North General Hospital. Had some supper and then went to sleep. William Francis Eve (1894-1981) was born in Clapham, London, on 22 September 1894, the son of Richard Edward Eve and Emmeline Augusta Eve. His father was a silversmith and the family lived at 9 Solon New Road, Clapham. By 1911 William had moved in with his uncle Henry James Melhius and his wife Blanche Millicent at 3 Highworth Gardens, Midhurst Road, West Ealing, Middlesex. 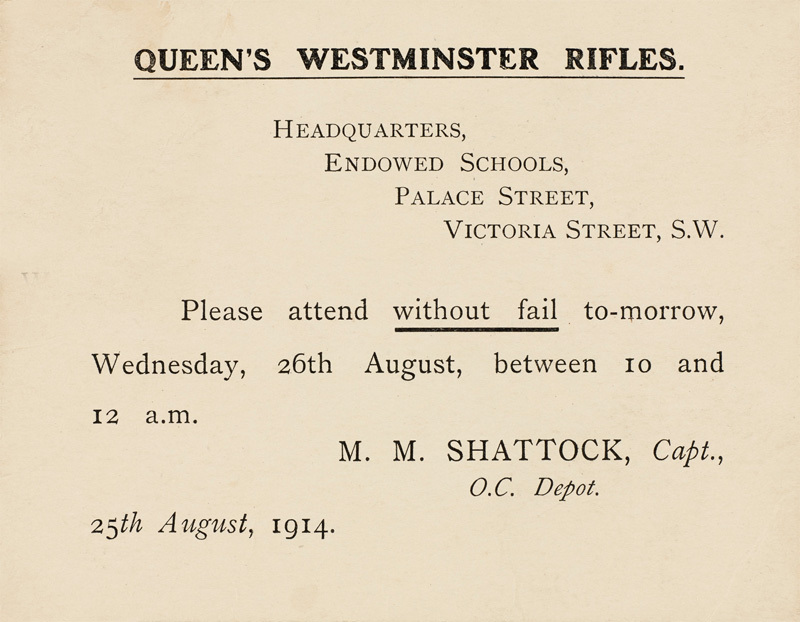 Around this time he also joined the Territorial Force, enlisting with The Queen’s Westminster Rifles. Following the outbreak of war, Eve was called up on 26 August 1914 and joined his unit at its headquarters at 58 Buckingham Gate. 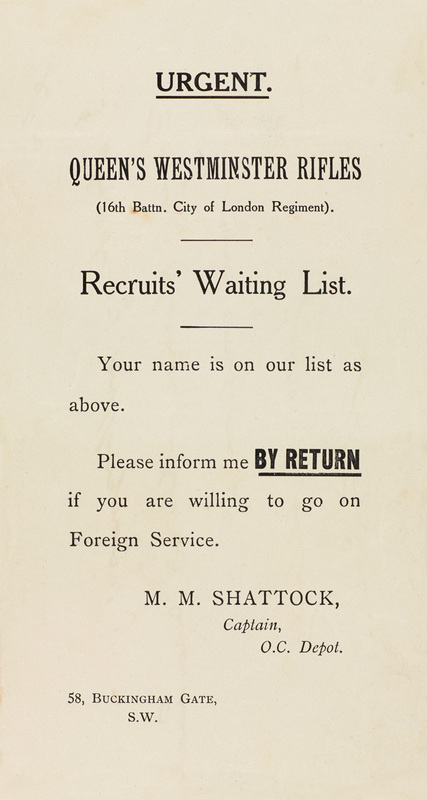 Like most Territorial soldiers he immediately volunteered for ‘Foreign Service’. After forming up at Hemel Hempstead, his battalion eventually landed at Le Havre on 2 November. 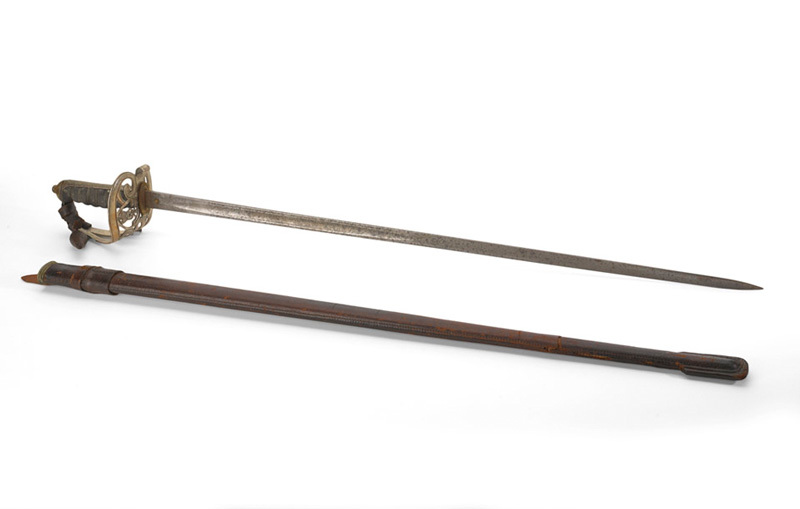 The Queen’s Westminster Rifles were amongst the very first Territorials to enter the line as reinforcements for the hard-pressed British Expeditionary Force (BEF). 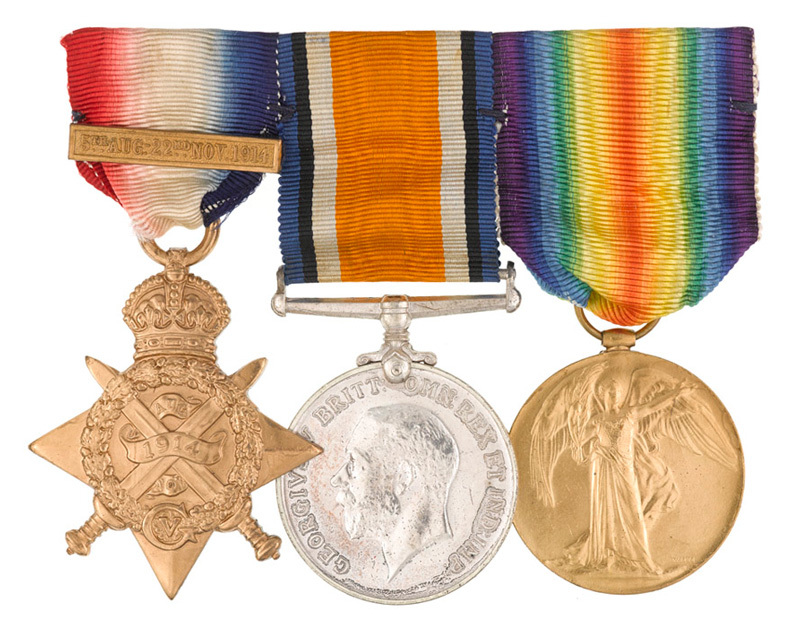 On recovering from trench foot, Eve was promoted to lance-corporal and eventually commissioned in September 1915 as a second lieutenant in the 2/6th (City of London) Battalion (Rifles), The London Regiment. 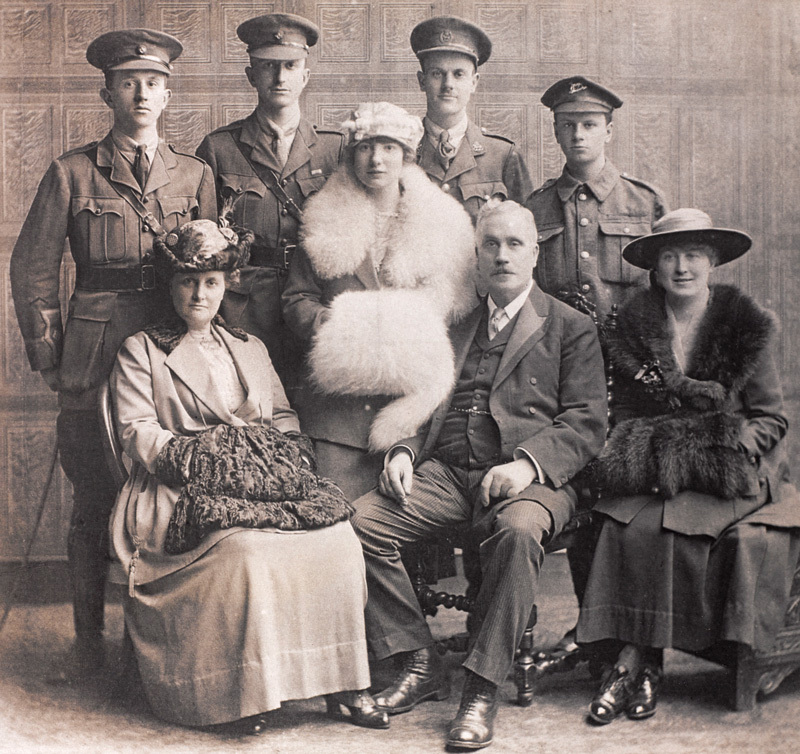 Unfortunately, he developed epilepsy and was invalided from the Army in July 1916. Eve settled at 79 Harrow View, Harrow, Middlesex. He married in 1922 and lived in Surrey where he died in February 1981.